Proudly serving the Huntington County area since 1964, Wertenberger's Best-One Tire and service does more than just sell tires & vehicle service. We build relationships. After almost half a century in the community, we find ourselves blessed with the opportunity to do business with many third generation members of local families. 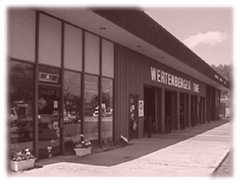 Wertenberger is a founding member of the Best One Tire and Service group. This provides you with lower prices with the buying power of 250 plus locations. With thousands of tires in stock, we are able to meet your goals. Whether you are looking for lowest initial cost or lowest cost per mile, we have the tire you need. In many sizes, we may have over twenty choices in stock. We will help you pick the grade or quality, traction aspect, speed rating, handliing ability and brand you prefer. Wertenberger Tire stocks Bridgestone, Firestone, Goodyear, Mastercraft, Fuzion, Toyo, and Carlisle brands among many more. We stock tires for cars, suvs, crossovers, pickups, vans, semis, trailer, lawn, and farm equipment. Wertenberger Tire does more than just tires. We have A.S.E. certified brake, alignment, and suspension technicians. We have state of the art Computer alignment and tire changing machines. We also offer lube and oil, fuel pumps, batteries, and a wide variety of services even including light bulbs. National and Fleet Service accounts welcome!! !